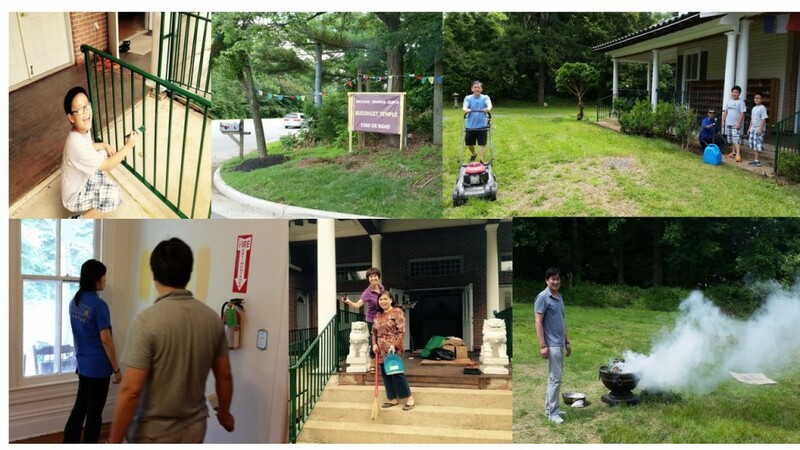 On May 29, 2015, DDSC has finally acquired a permanent physical temple at 5300 Ox Road, Fairfax, Virginia 22030, in Fairfax County of Northern Virginia, within the vicinity of Washington DC. 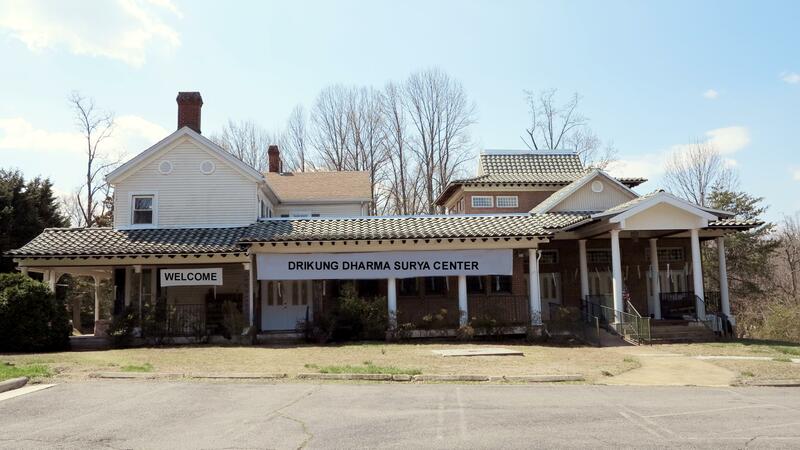 The DDSC temple is located in the heart of Fairfax County of Northern Virginia (see below – front view of the temple), 30 minutes of drive from Washington D.C., the US National Capital. 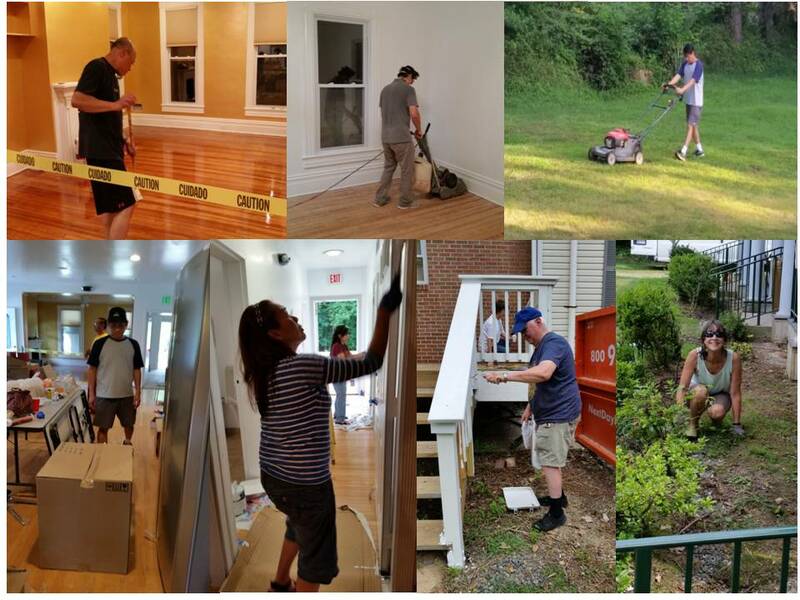 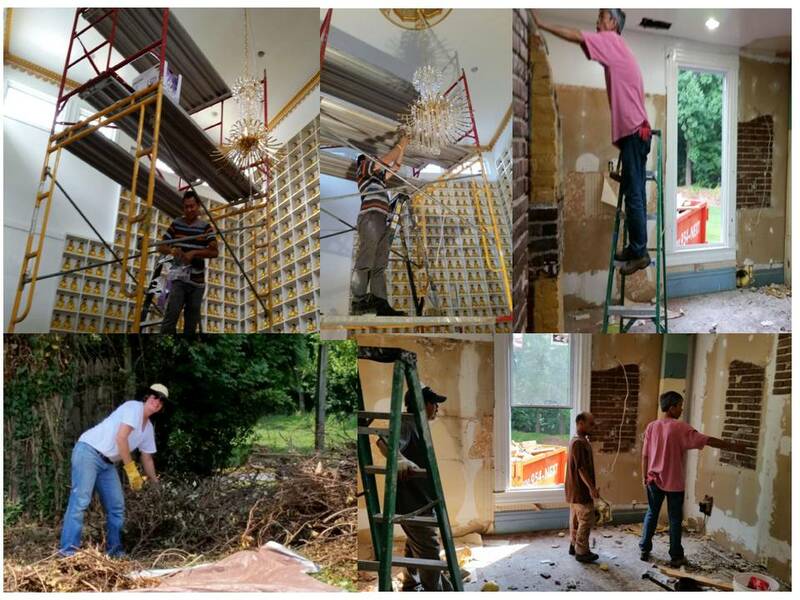 Since June 1, 2015, we have been able to tackle and accomplish many important renovation tasking in the newly acquired temple. 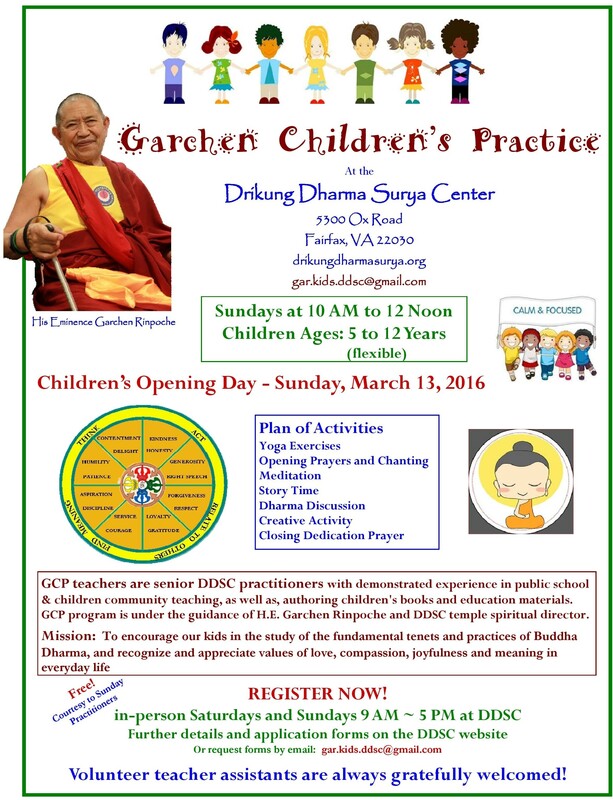 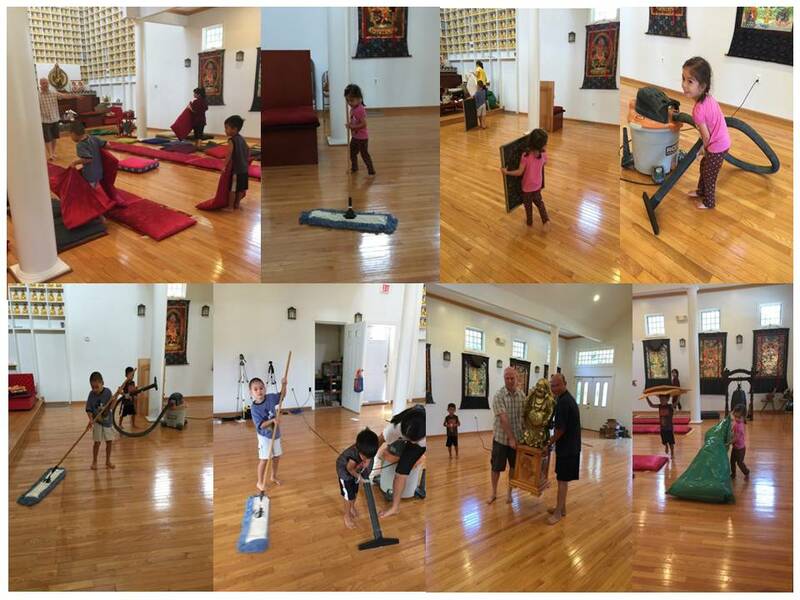 Many dharma brothers, sisters and friends (including young Dharma “toddler” brothers, grandma and grandpa) have come and given DDSC their hands and unconditional love. 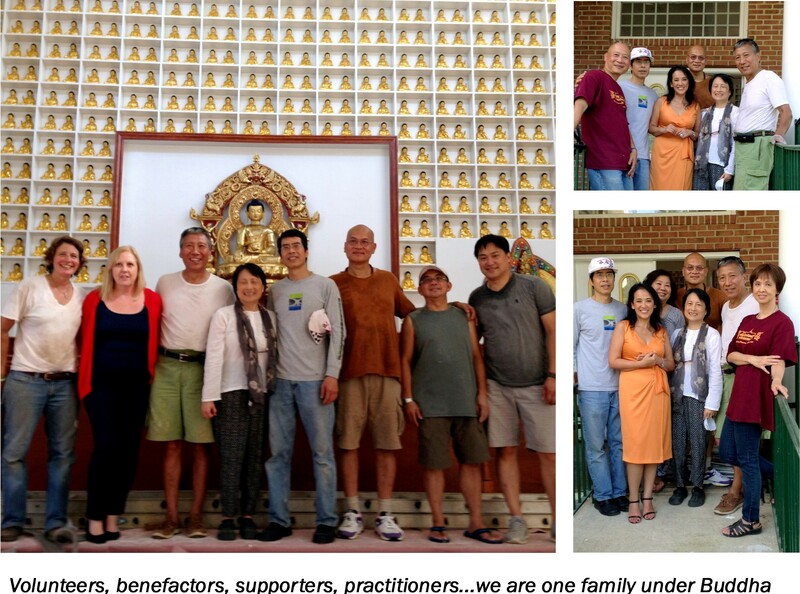 At the end of the work day, we usually make smoke offering to all sentient beings around. 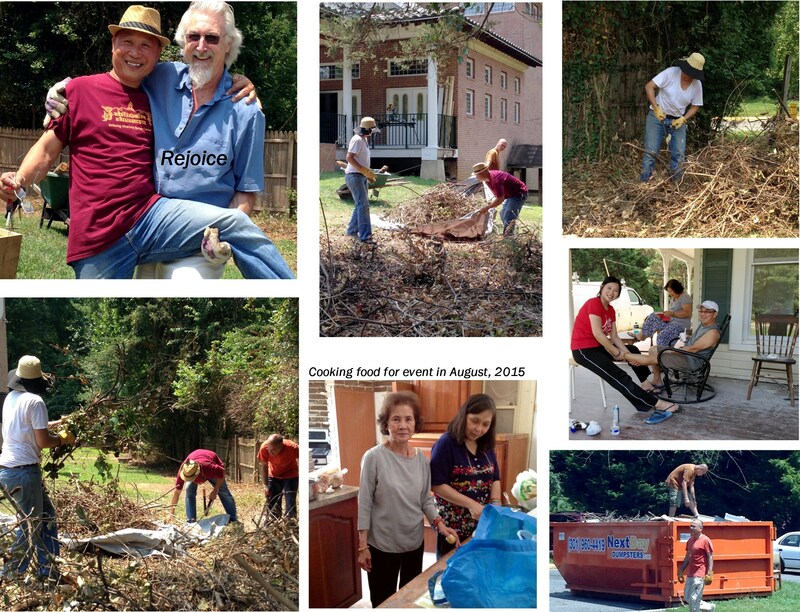 And everyone have had great time together, as seen from few photos herein. 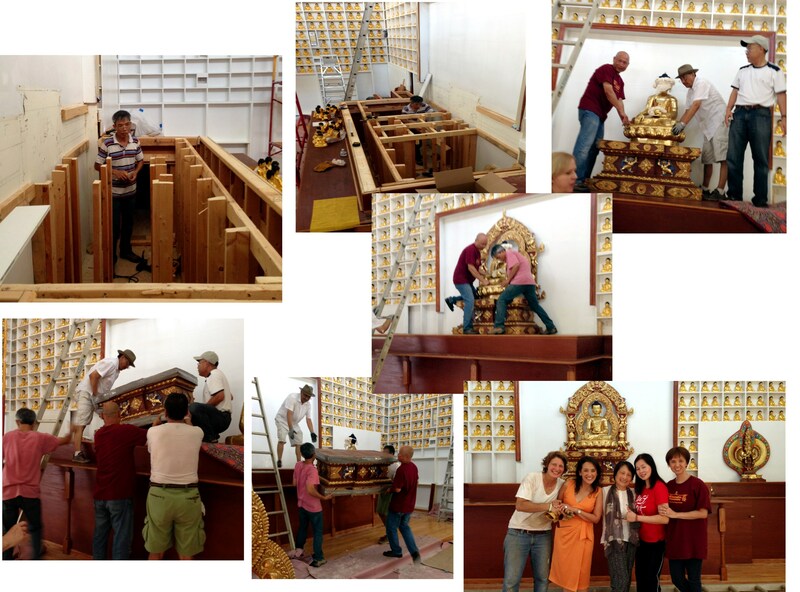 Our temporary Temple sign is put up at the street corner of Ox Road. 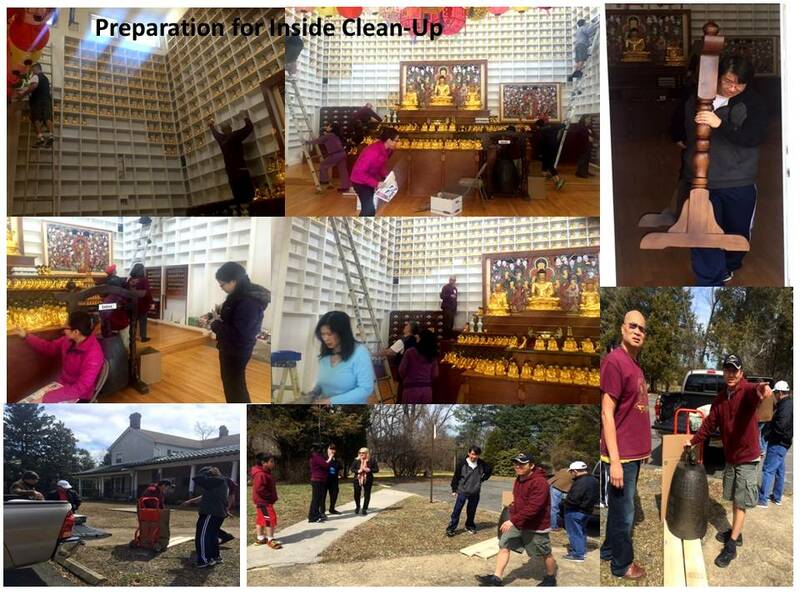 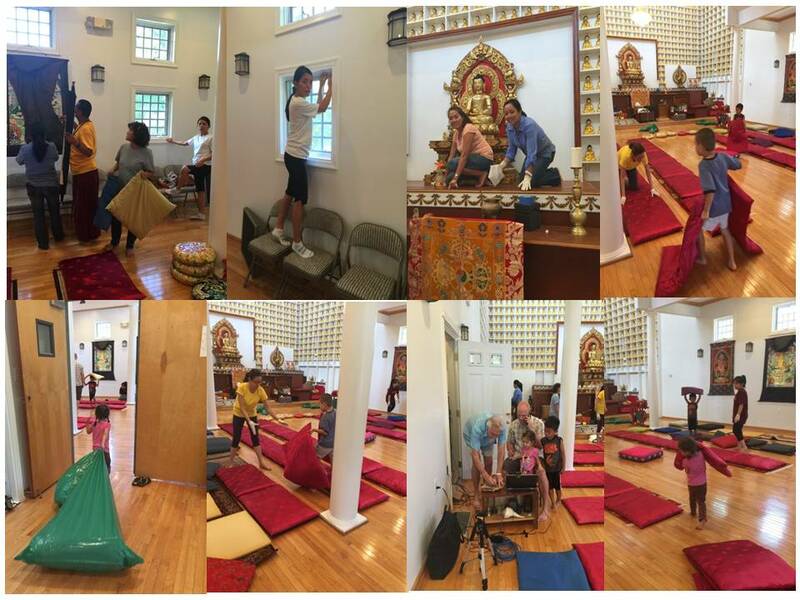 Major temple clean-up and removal of all unused items and debris are completed. 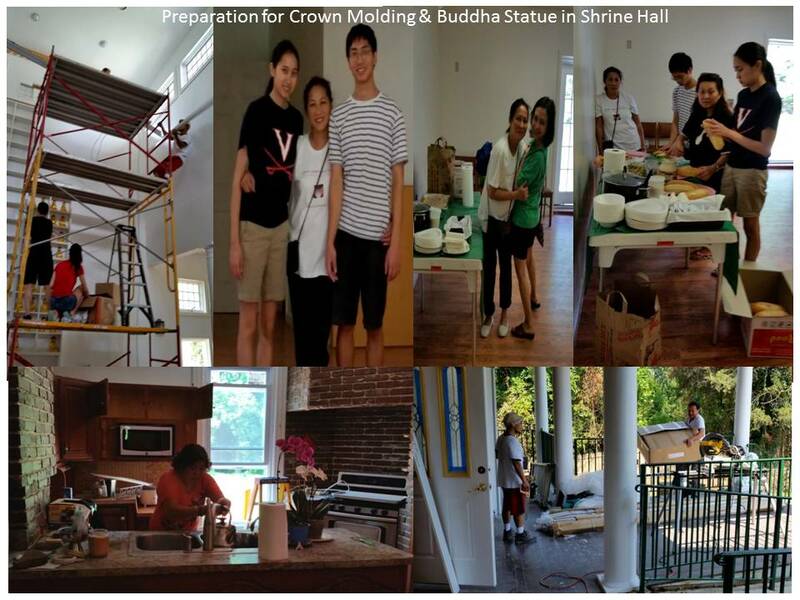 Renovation of the A/C systems for both the lama house and the Meditation/Shrine Hall are completed. 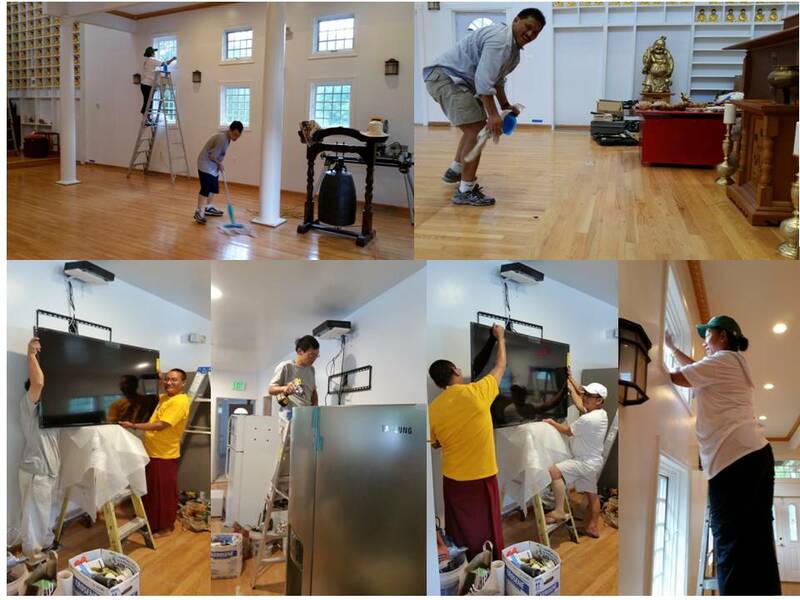 Hardwood floor sanding for the entire lama house, lighting works, renovation of the temple gift shop and backyard deck, as well as yard tree trimming are on-going. 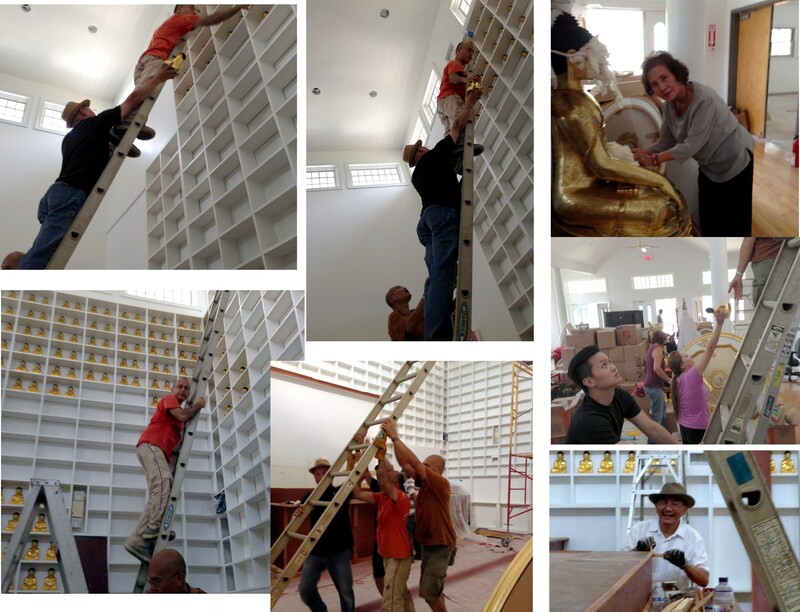 Painting on the temple front handrails and the temple basement are completed. 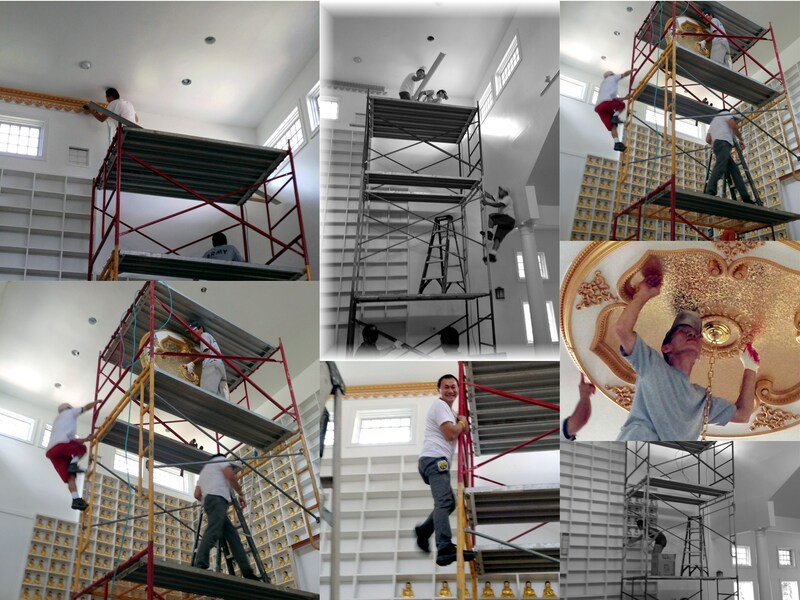 Installation of internet/WiFi connection and video/audio sound systems are on-going. 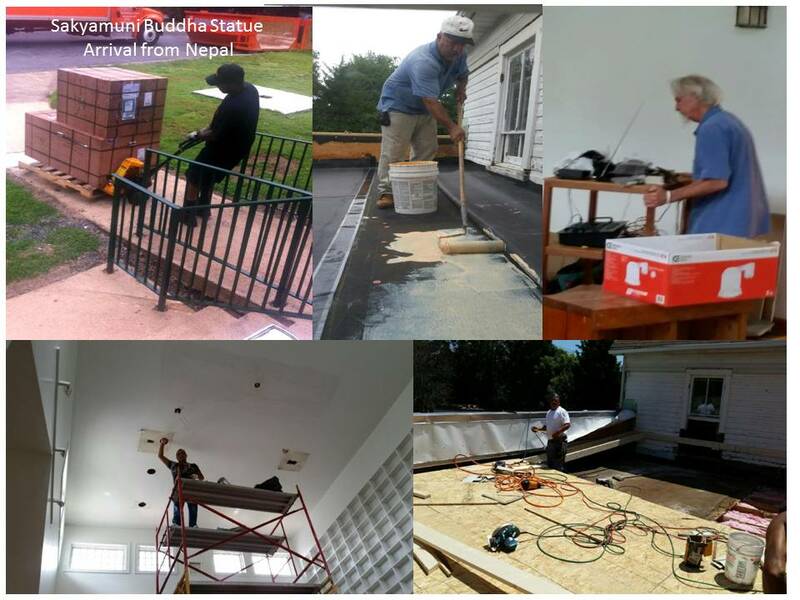 Roof fixes for the cafeteria hall, fireplaces and windows replacements for the lama house, and Meditation/Shrine Hall painting are on-going. 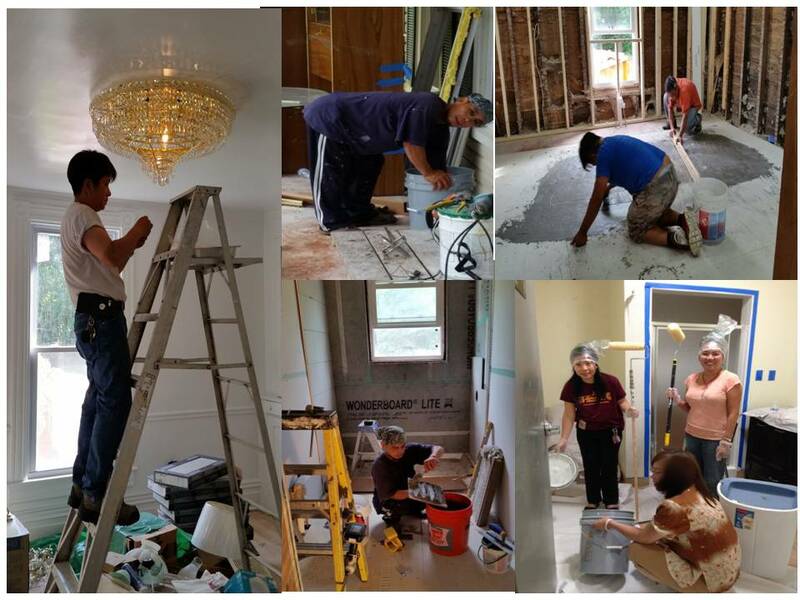 Plumbing fixes and bathroom renovation for Garchen Rinpoche’s bathroom and 3 main bathrooms of the temple are hoped to complete before August. 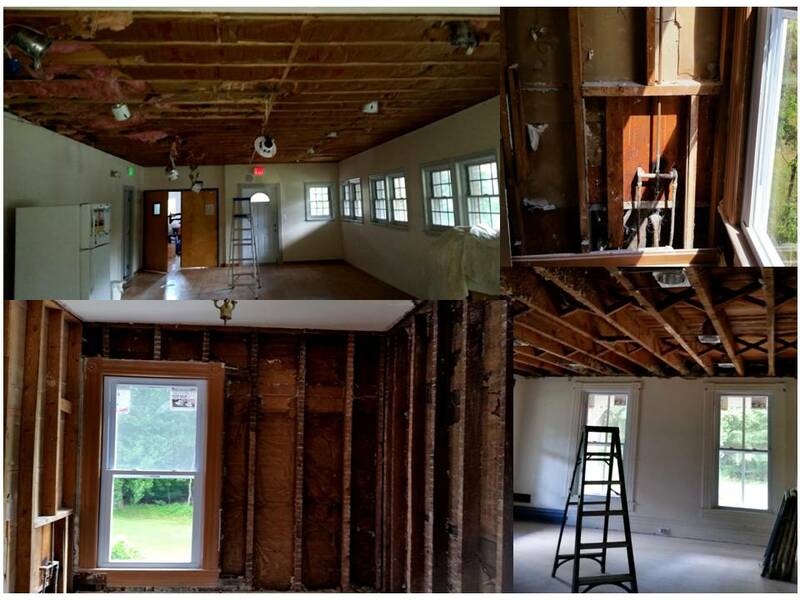 Cost estimates for cracked wall fixes in the lama rooms, lama house kitchen renovation, as well as fixes on damaged temple tiled roof and soffits are being assessed and can start whenever financially feasible. 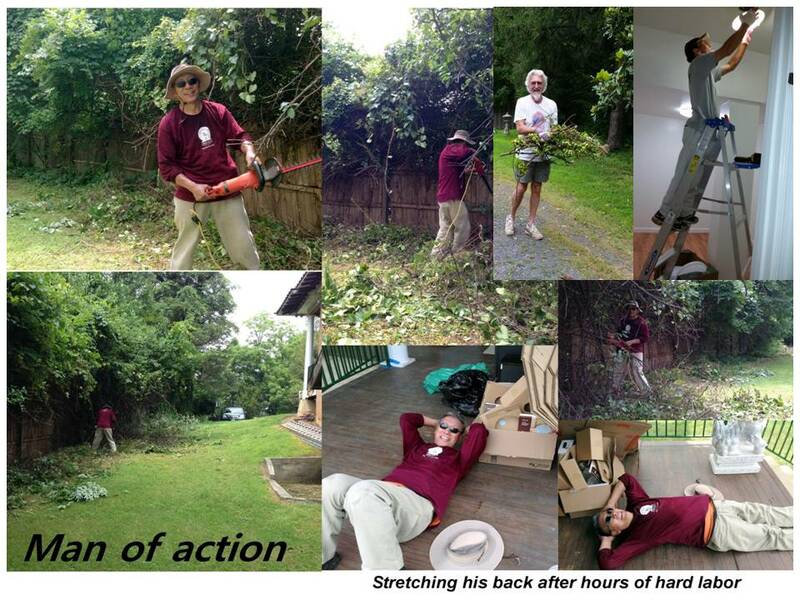 And many, many more tasks to be done! 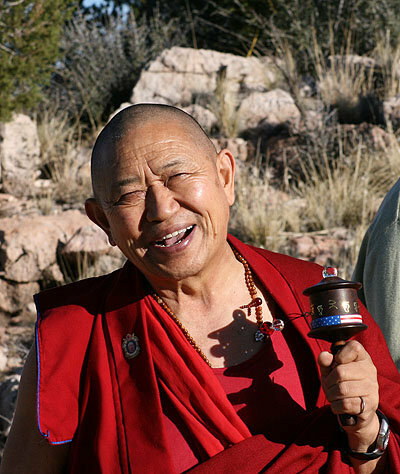 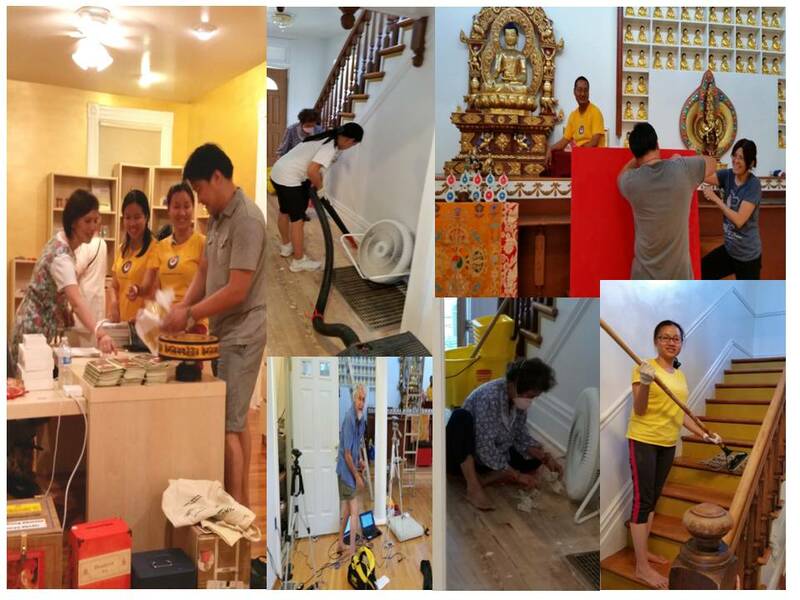 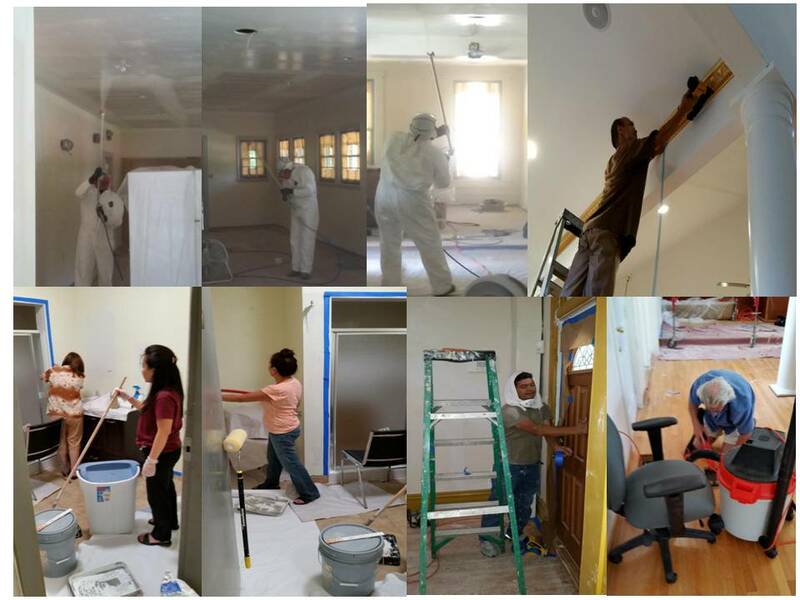 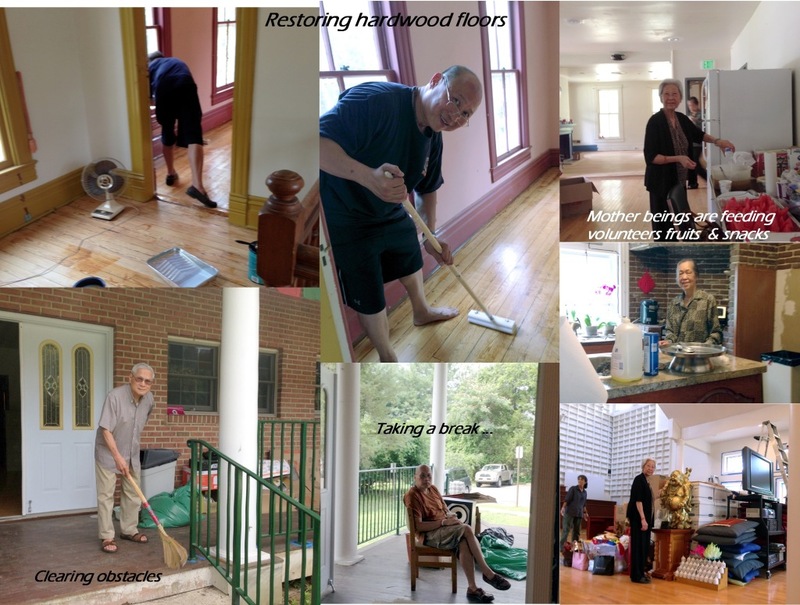 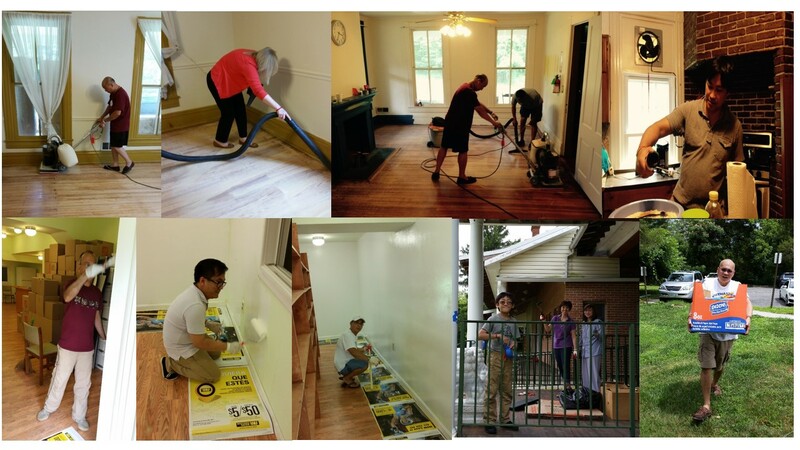 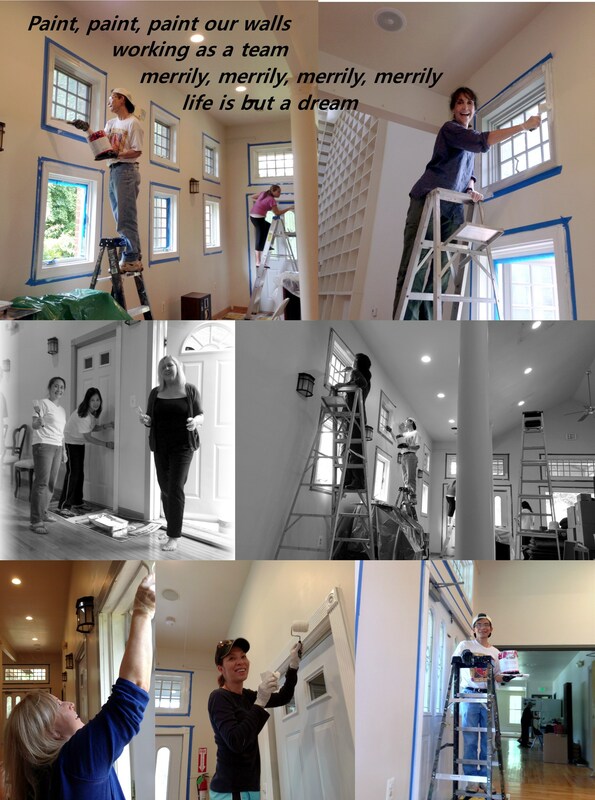 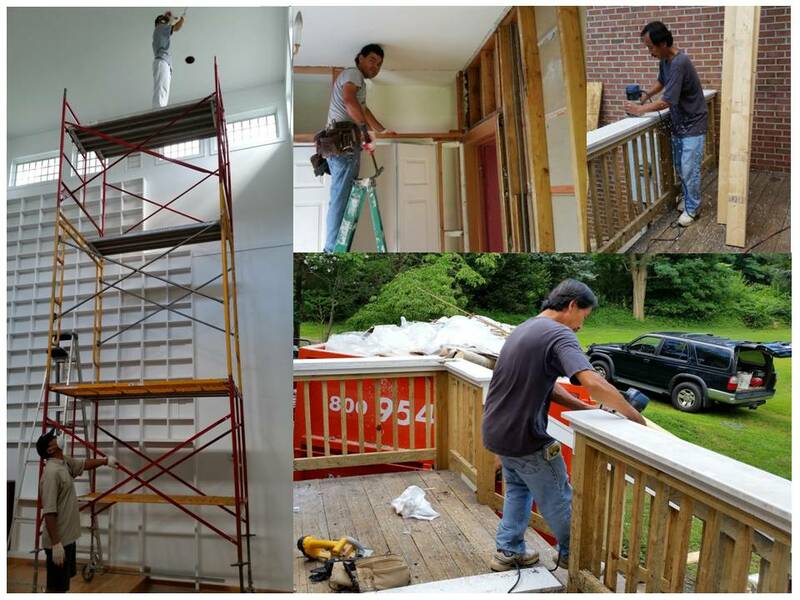 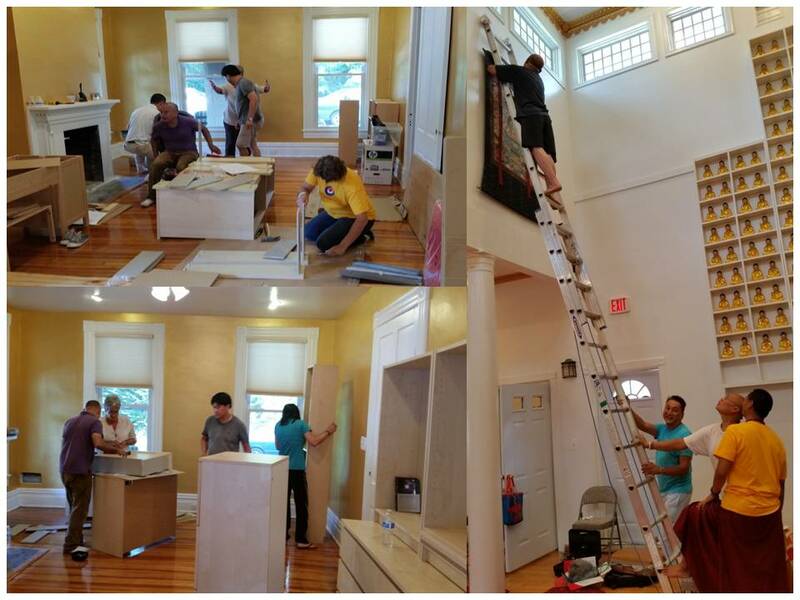 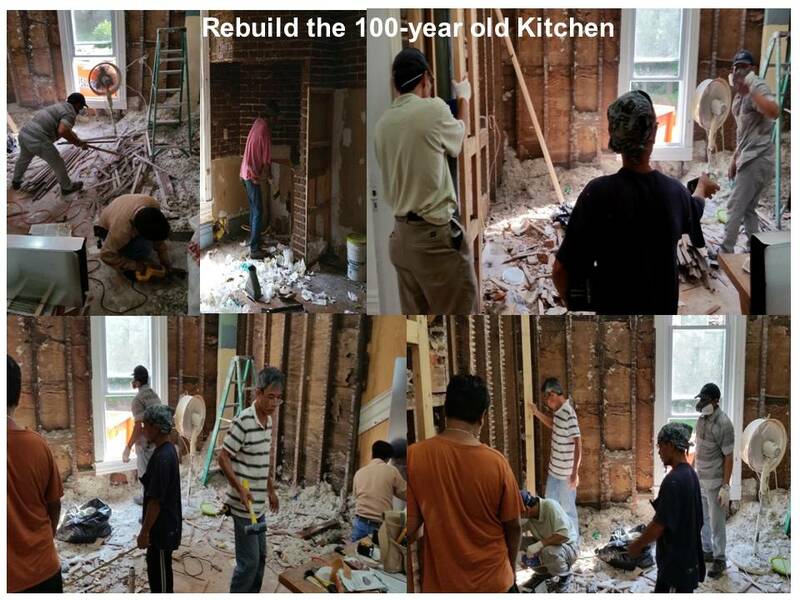 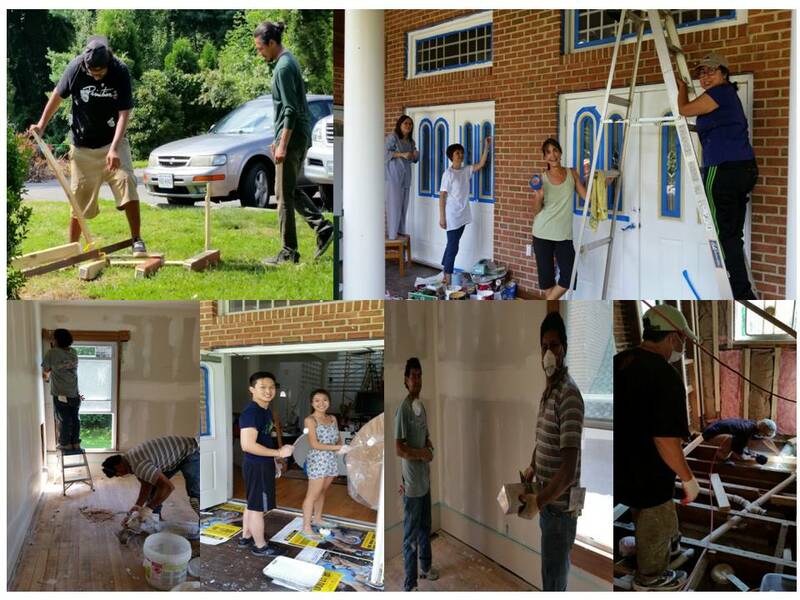 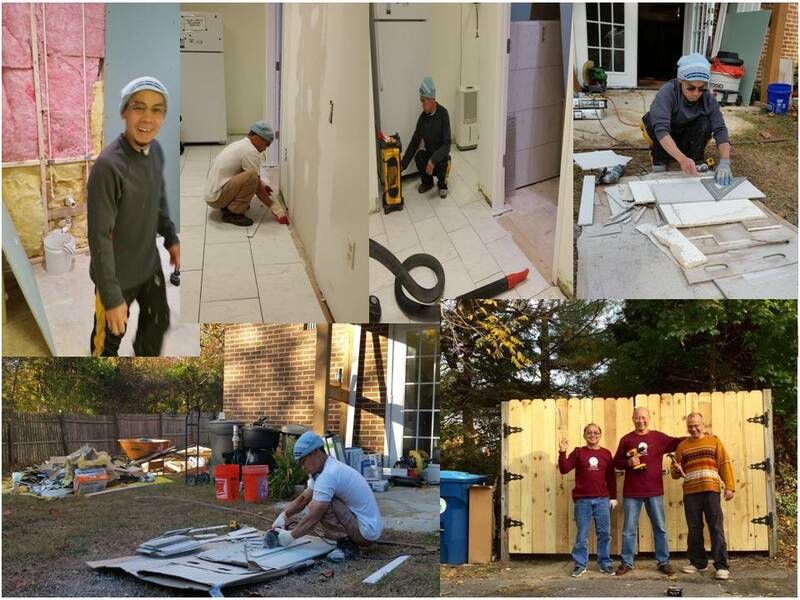 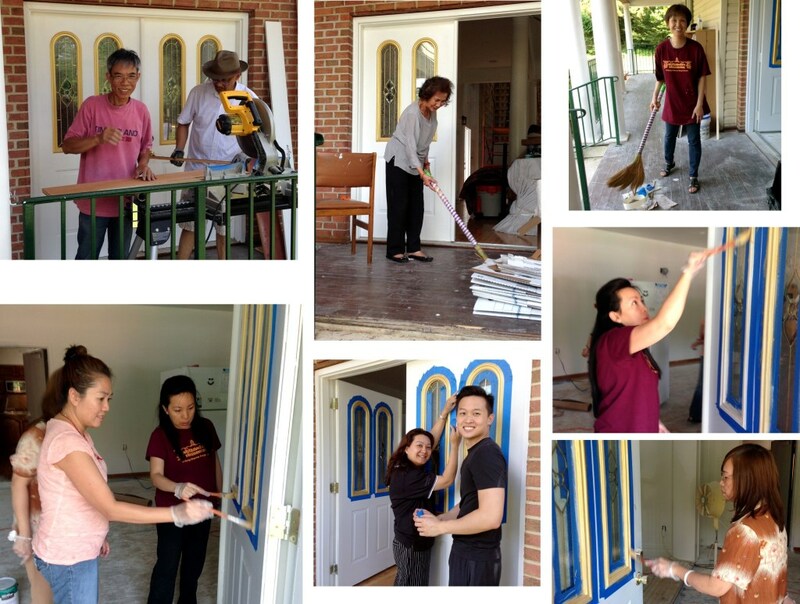 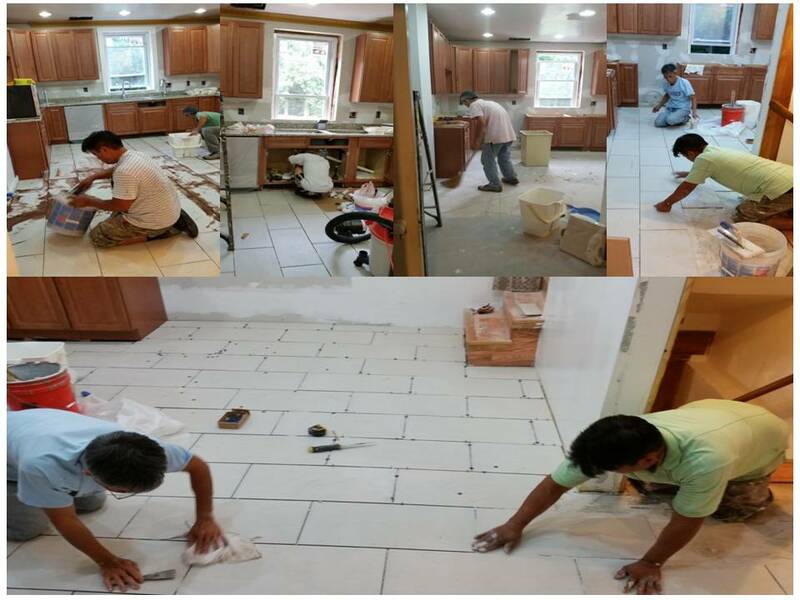 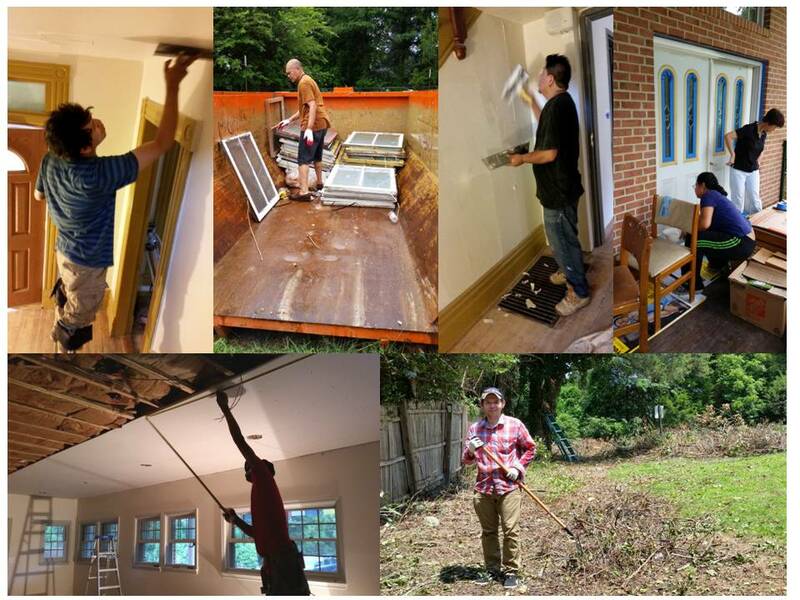 We continue to need more help on many on-going renovation areas, including furnishing and painting of the lama house where Garchen Rinpoche and the lamas will stay during the Special Nine (9) Sublime Days in upcoming August 2015. 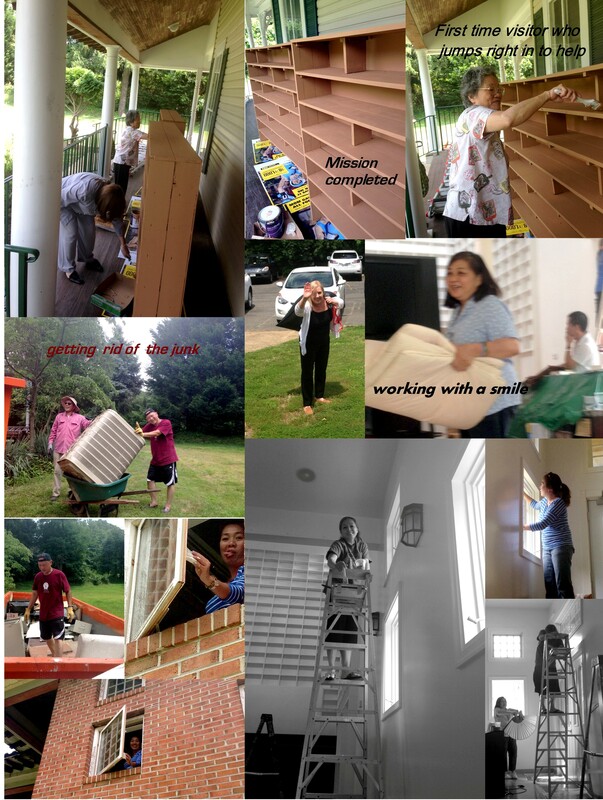 If all possible, please come and give us a hand whenever feasible with your schedule during any weekend. 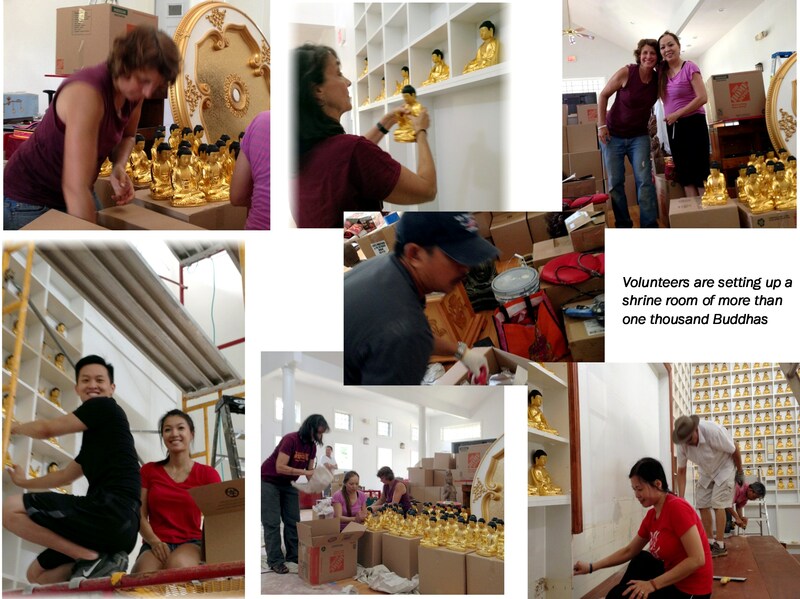 No volunteer job is too small nor too big. And do not hesitate to reach out to friends and take them along to our temple. 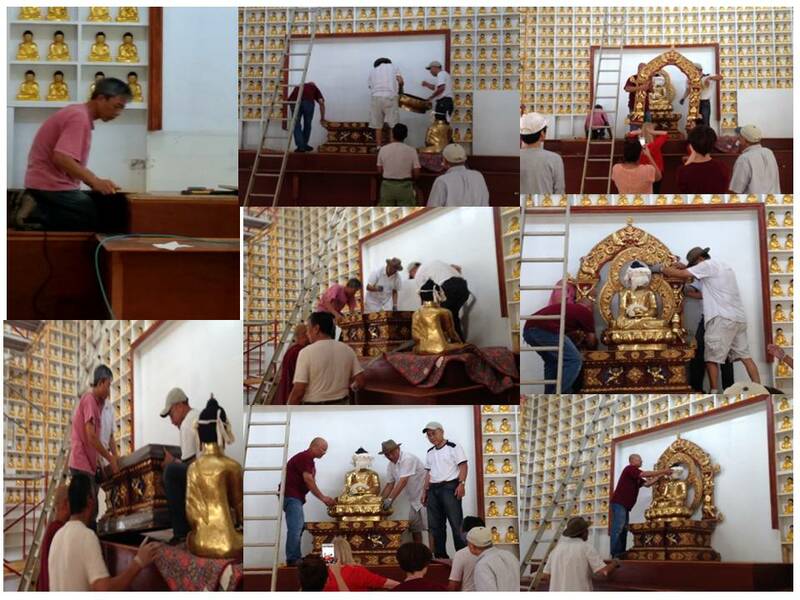 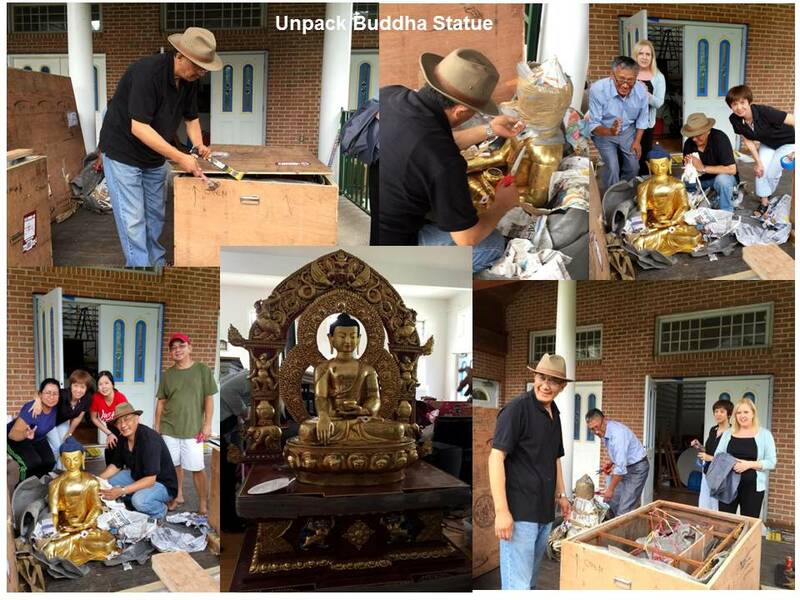 With the unconditional support of one of our generous benefactors, the Main Buddha Sakyamuni Statue for the Shrine Hall was ordered from Nepal and has finally arrived at the temple. 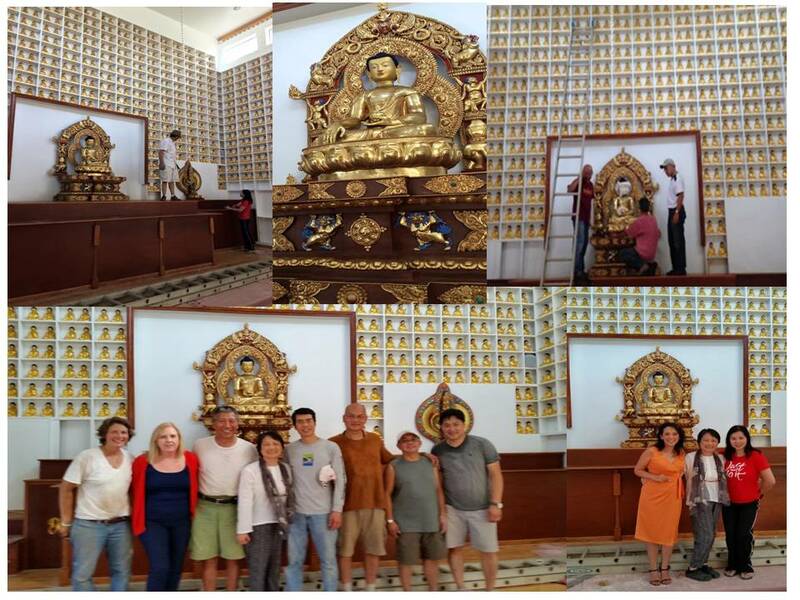 Buddha Sakyamuni statue is set up in the Shrine Hall surrounded by more than 1,000 Buddha statues. 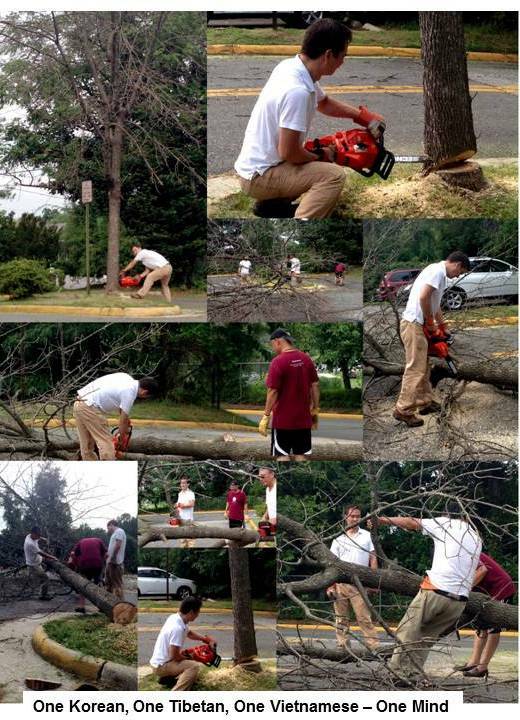 Yard tree trimming, painting, cleaning, drywall work for the lama house, and ceiling replacement for the cafeteria hall to be completed soon. 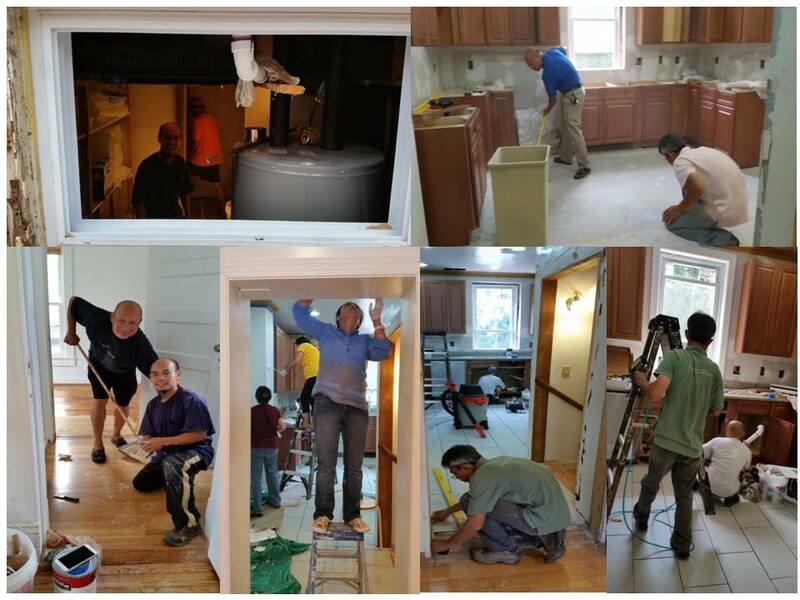 Renovation of bathrooms for the lama house, the kitchen and the temple main hall are underway. 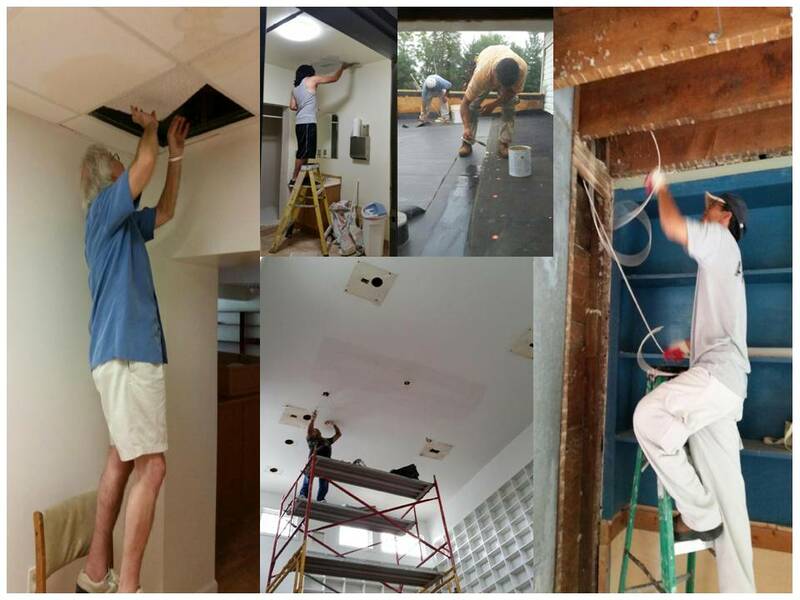 We went ahead to replace the broken water heater and the water leaking ceiling of the cafeteria hall. 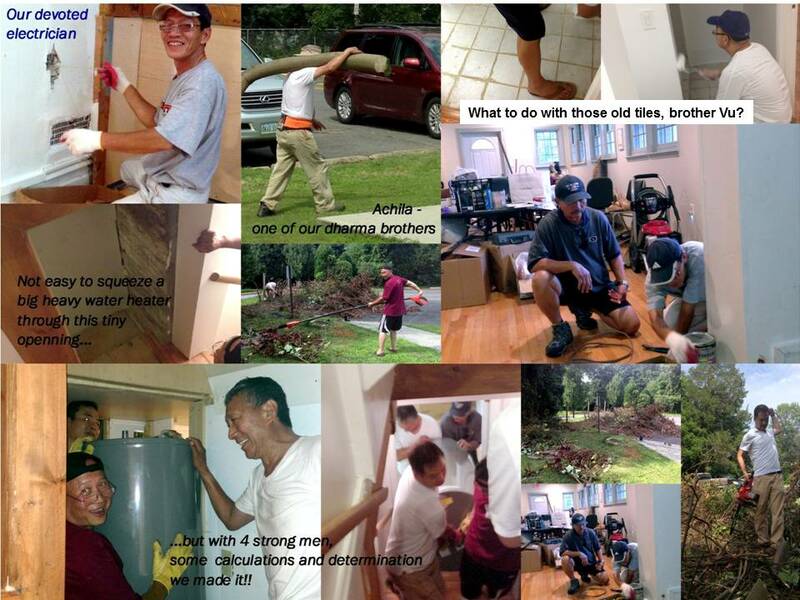 We have uncovered many hidden problems and damages, but we got a team of warmed-heart contractors who are willing to go above and beyond to rebuild for us. 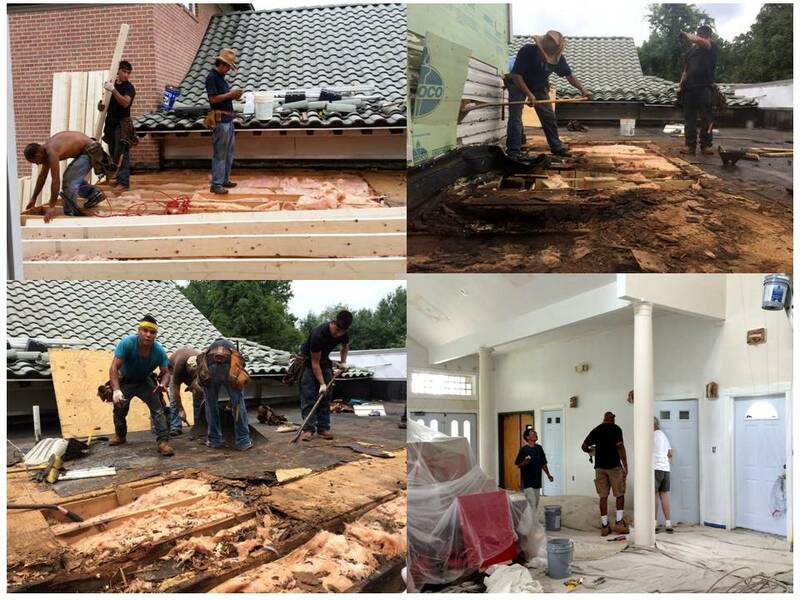 While we are trying hard to work around and carefully use our building operation savings to cover expenses for these critically needed task items, if you happen to know anyone who can help by labor, materials or monetary contribution, please do not hesitate to reach out for support. We wish to thank you very much for your faithful and unconditional support to contribute towards the fulfillment of the enriching mission DDSC. 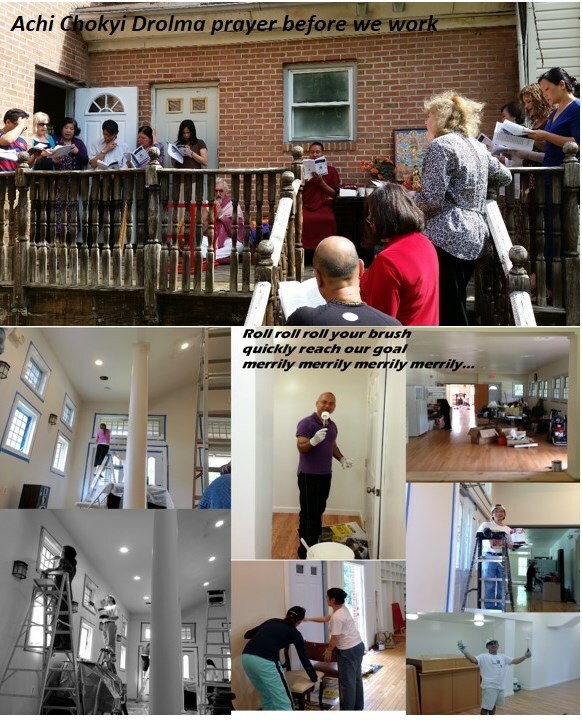 Whether you have given monetary gifts, contribution of services, or through rejoicing and training your mind – it has taken all kinds of thread to make a complete quilt, and you are the ones who have helped make that possible!